Both savvy and sassy, this cool pink cocktail party design speaks volume about your style. 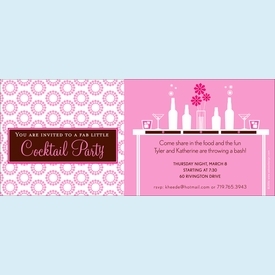 Horizontal format with pre-printed box on left side: "You are invited to a fab little cocktail party". CLOSEOUT -- only a few sets left! SIZE DIMENSIONS: 9.25" x 4"